SOLD OUT FARM AID THIS SATURDAY - WATCH AND LISTEN! Farm Aid 2013 will be held this weekend on Saturday, Sept. 21, at the Saratoga Performing Arts Center (SPAC) in Saratoga Springs, NY. Farm Aid 2013, which quickly sold out of all 25,000 available tickets, will feature Farm Aid board members Willie Nelson, John Mellencamp, Neil Young and Dave Matthews with Tim Reynolds, as well as Jack Johnson, Amos Lee, Jamey Johnson, Kacey Musgraves, Toad the Wet Sprocket, Sasha Dobson, Carlene Carter, Lukas Nelson & Promise of the Real, Bahamas, Pegi Young & The Survivors, Jesse Lenat, Insects vs Robots, The Blackwood Quartet, Will Dailey and The Parlor. Click HERE to learn more about the days events, including details on the HOMEGROWN village and other events. Watch & Listen: For those who can't make the concert, there will be a live concert webcast on farmaid.org from 5 to 11pm EDT and live audio broadcast on Willie Nelson's SiriusXM channel, Willie's Roadhouse (56), beginning at 2pm EDT. Mellencamp.com Coverage: The Mellencamp.com WebTeam will be at Farm Aid 2013 and will be posting updates throughout the day on John's Facebook, Twitter, and Instagram pages! Official Farm Aid App: The official #FarmAid2013 app is now available in the Apple App and Google Play stores for Apple and Android devices! 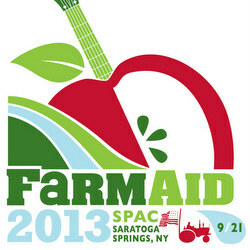 Download it now and use it for all the info you need on your #Road2FarmAid! iPhone app: http://farmaid.org/iphone Android app: http://farmaid.org/android View the entire lineup, and add artists and HOMEGROWN 101 workshops to your personal schedule. Take a look at the festival map, check out the HOMEGROWN Concessions menu, and learn about the interactive exhibits in the HOMEGROWN Village and our Farmer Heroes. Food Drive at the Concert: Farm Aid is partnering with Regional Food Bank of Northeastern New York to help meet the needs of the hungry across the region by collecting non-perishable food items at the main entrances to Saratoga Performing Arts Center. Concertgoers can bring non-perishable food and non-food items that are in boxes, cans or plastic bottles (no glass). Suggested donation items include canned tuna and protein, canned fruits and vegetables, cereal, hearty cold weather meals like stew and soup and peanut butter. 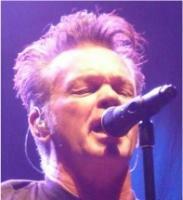 The Butler Institute of American Art is to present the exhibition "The Paintings of John Mellencamp" November 3, 2013 through January 12, 2014. This show, which will feature some forty paintings, some never before seen by the public, is the artist’s first art museum exhibition. According to Butler Drector and Chief Curator Dr. Louis Zona, who organized the exhibition, "The Butler is pleased and proud to showcase these remarkable paintings by an American icon. 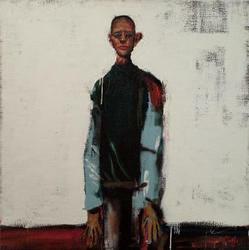 Mellencamp’s very personal works, rooted in the traditions of European expressionism, display a unique understanding of art history, theory and composition. They are crafted with both skill and spontaneity by a great talent who is truly "twice blessed" with the creative gene. Read the complete press release HERE. 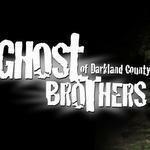 GHOST BROTHERS OF DARKLAND COUNTY - LESS THAN ONE MONTH UNTIL TOUR KICK OFF! 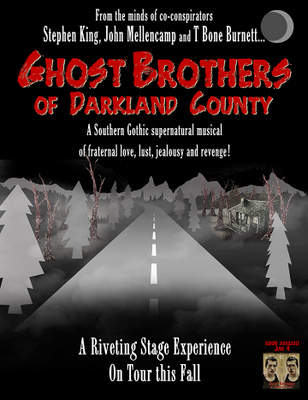 AEG Live is pleased to announce the touring cast for the southern gothic, supernatural musical Ghost Brothers of Darkland County, libretto by Stephen King, with music and lyrics by John Mellencamp and musical direction by T Bone Burnett. The show stars actor Bruce Greenwood as the father Joe McCandless. Greenwood, is perhaps best known for his roles as JFK in the film Thirteen Days, Flight and Captain Christopher Pike in the 2009 Star Trek film and its sequel, Star Trek Into Darkness. Also starring is Emily Skinner as Joe’s wife, Monique. Skinner is a well-known stage actress who received a Tony Award nomination for Side Show, and has had leading roles on Broadway in Jekyll & Hyde, James Joyce’s The Dead, The Full Monty and Billy Elliot. Mellencamp band members fill out the on stage performing ensemble: bandleader Andy York on guitar, percussionist Dane Clark, Troye Kinnett on keyboards and harmonica and upright bassist Jon Gunnell. 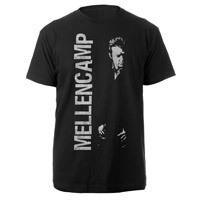 Read the complete list of cast members on Mellencamp.com. Tickets are ON SALE NOW. Read the press release with ticket details on our Ghost Brothers Mini Site. If you have purchased a copy of the album version of the album click HERE to learn more and listen to samples! JOIN THE GHOST BROTHERS STREET TEAM FOR FREE TICKETS & AUTOGRAPHED POSTER! 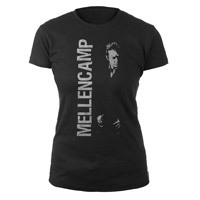 We are building a small street team of devoted Mellencamp fans to help promote their local Ghost Brothers of Darkland County show. Activities we are looking for help with include: putting up posters/flyers in high profile locations, watching for press mentions, and other optional miscellaneous promotional activities. In return for the help, those selected will receive an autographed Ghost Brothers poster signed by John, Stephen and T Bone along with free tickets or a ticket upgrade. If you are interested in learning more or want to sign up click HERE where we will be posting more details in the coming days. THE BIG JOHN TEE RETURNS - NOW WITH A LADIES TEE TOO! By popular demand, the Big John tee is back! Now offered in a ladies style! Arrived back in Canada last night after my 8+ hr. drive from Saratoga Springs. Concert was an amazing day with some musicians and performances I will never forget. So many memories to share and the message is clear; we ALL need to be doing our part to support local farmers and to keep our earth a healthier environment for everyone.